I was surprised to see snow falling this morning as I made my way to the train station. The news didn't mention it but when I reached the train I noticed a layer of white stuff on the cars that had sat overnight in the parking lot. I don't expect much accumulation but you never know. Tomorrow I'll take a drive over to Stillwell Woods to check out conditions for Sunday's race. 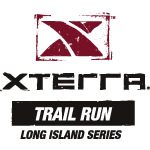 I'm hoping that they will have the XTERRA course marked so I can get a better sense of the route. I'm still concerned that I could get lost! Since I've finished the running portion of my taper I'd planned to rest this morning. I decided instead to do the 15 minute core workout, as I did on Monday, and I'm pleased that the work on some of the exercises is beginning to feel easier. I'm assuming I'm making some progress and soon I'll adopt the "make it harder" suggestions that accompany the Lolo core exercise descriptions and illustrations in the magazine. I always feel energized and stronger after doing this simple workout. I'm not sure if I'll do anything fitness related on Saturday or if I'll be self indulgent and rest. I really wish the race was tomorrow but Sunday will come soon enough. Good luck tomorrow in the woods! Thanks - good luck with your 5K pub run!